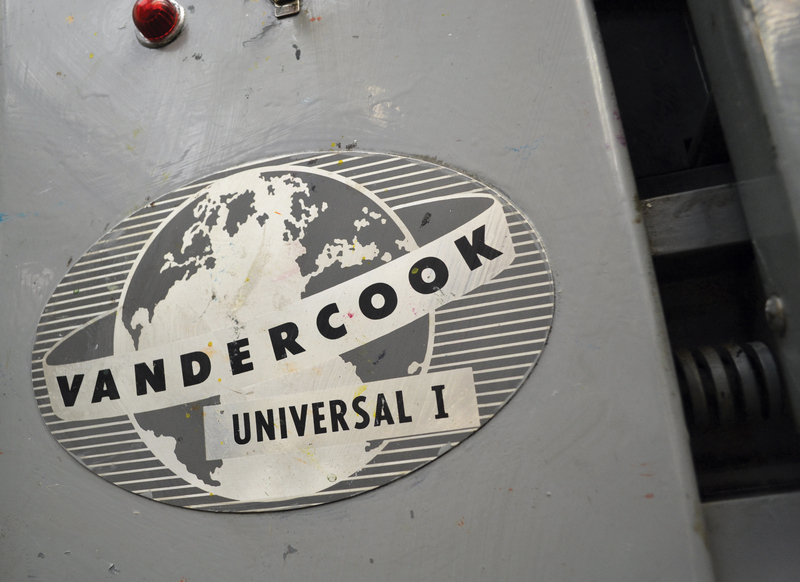 One of the many historic items in the Miami Curmudgeon Press type shop is a Vandercook SP-20 printing press manufactured in 1968. 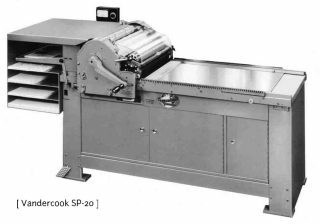 Vandercooks were originally used to print a clean proof of a composition of metal type, such as a page of the newspaper, to be read and proofed. 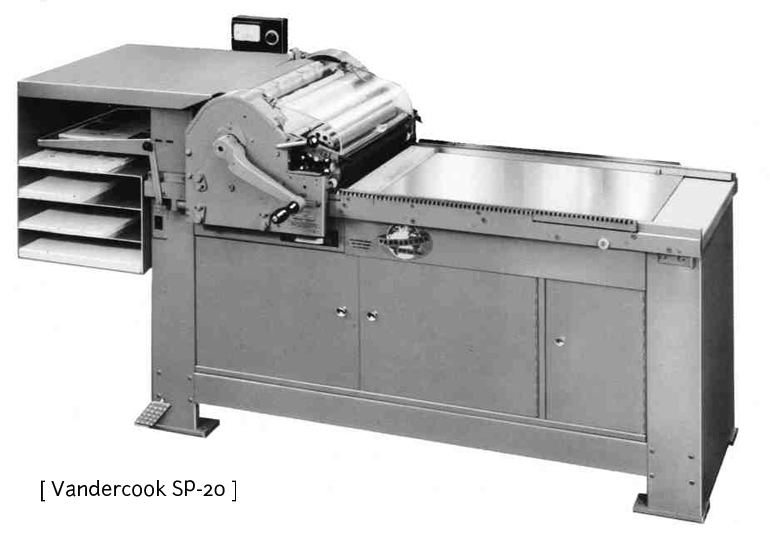 “Now widely found in art schools and book arts centers, Vandercooks are arguably the press of choice for fine press printers and book artists.” They are excellent presses for printing wood type posters or any other large scale items, but still “small” enough to be part of a home shop/studio (small being relative, the SP-20 weighs 1,140 lbs.). 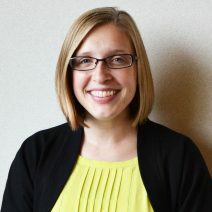 Letterpress owners have to maintain their presses in order to keep them running smoothly and printing well. 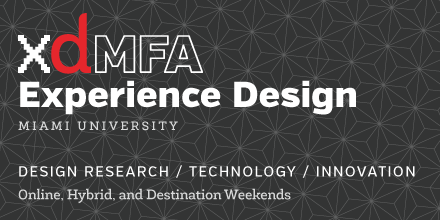 It is one of my roles at Miami to care for the printing equipment in the Hand Media Studio aka. Curmudgeon Shop. 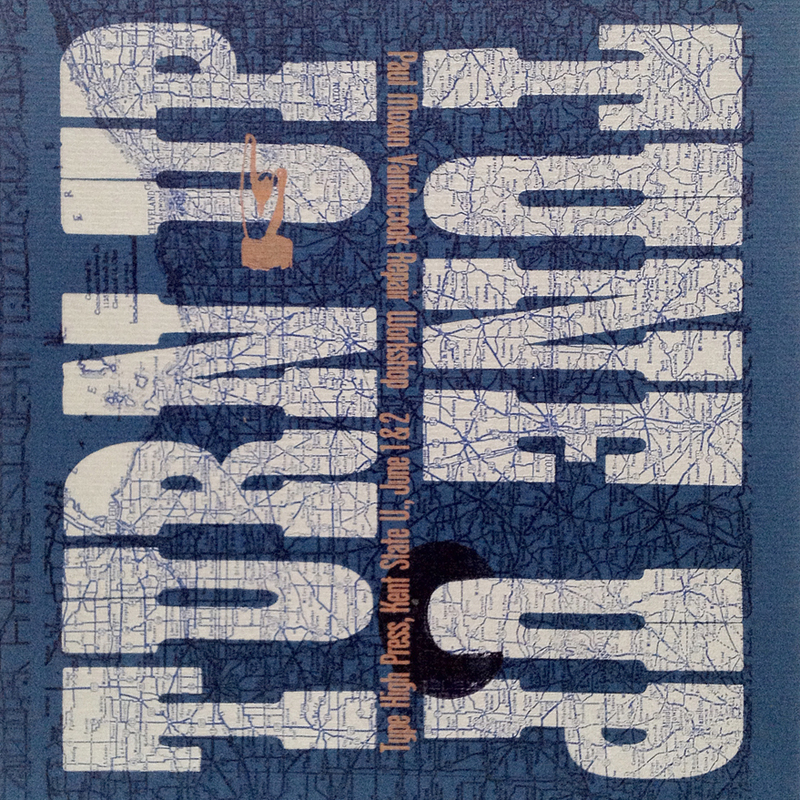 In pursuit of mechanical knowledge of Vandercook presses, I turned to the one and only Paul Moxon. 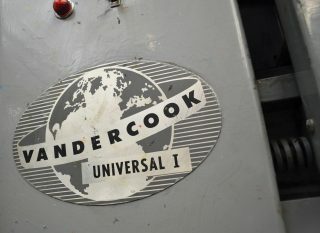 Paul created and moderates the Vanderblog which includes a Vandercook Census, Quick Specs, and an incredibly valuable blog/community space for Vandercook press owners to ask questions and learn from each others printing experiences. A letterpress printer himself, Paul also travels the country teaching workshops and doing “house calls” on presses and is the author of Vandercook Presses: Maintenance, History and Resources. 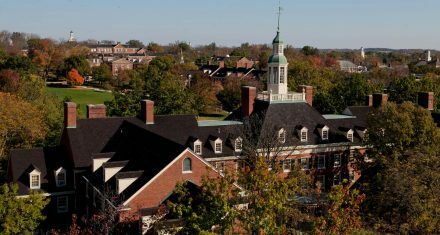 He is the Editor of the American Printing History Association (APHA) Newsletter and publishes limited edition books and broadsides under the imprint Fameorshame Press. Kent State University’s Bob Kelemen and I organized an Ohio Vandercook Maintenance Workshop this past June. 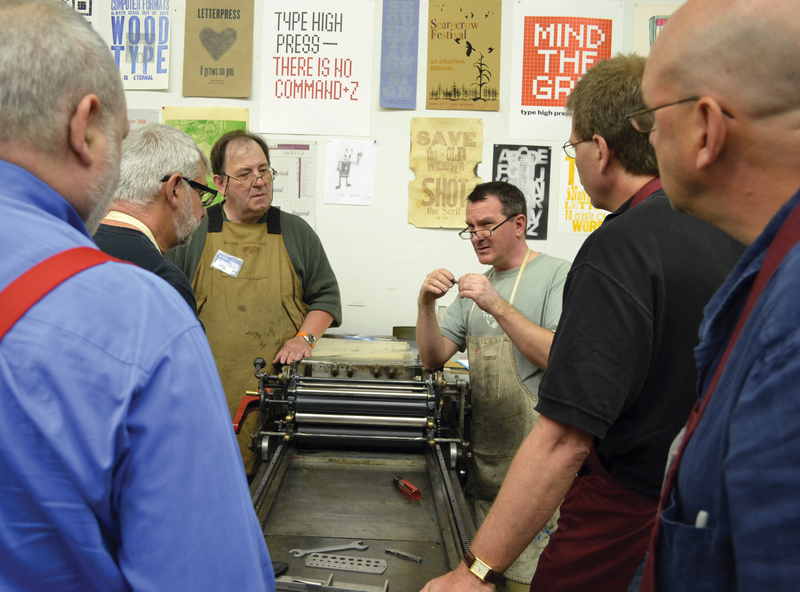 Paul led an in-depth review of the parts and functions of the Vandercook. We learned all the points of maintenance, lubrication and cleaning. The workshop took us beyond cranking the press and into the mechanical what and why essential for troubleshooting. Paul explained the differences between various models and we brought along questions, press photos and/or broken parts. In helping take apart, clean, lubricate and put back together the Type High Press’ Universal 1, I gained an immense amount of knowledge I will be applying to Miami’s presses. 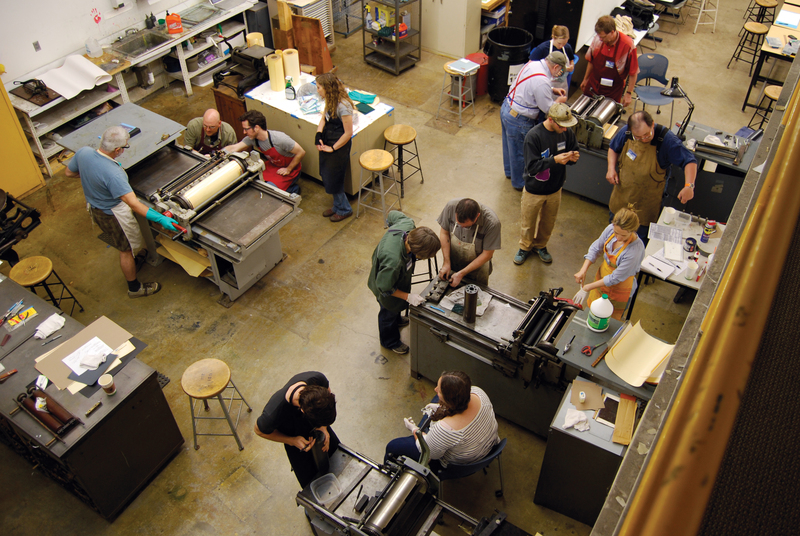 Fellow workshop participants were from Ohio University; Oberlin College; the Morgan Art of Papermaking Conservatory and Zygote Press (Cleveland); Ohio State’s Logan Elm Press and Igloo Letterpress (Columbus); Steam Whistle Letterpress & Design and Tiger Lily Press (Cincinnati). It was an exhausting and satisfying experience to get the KSU Type High Press Vandercooks into beautiful working condition. 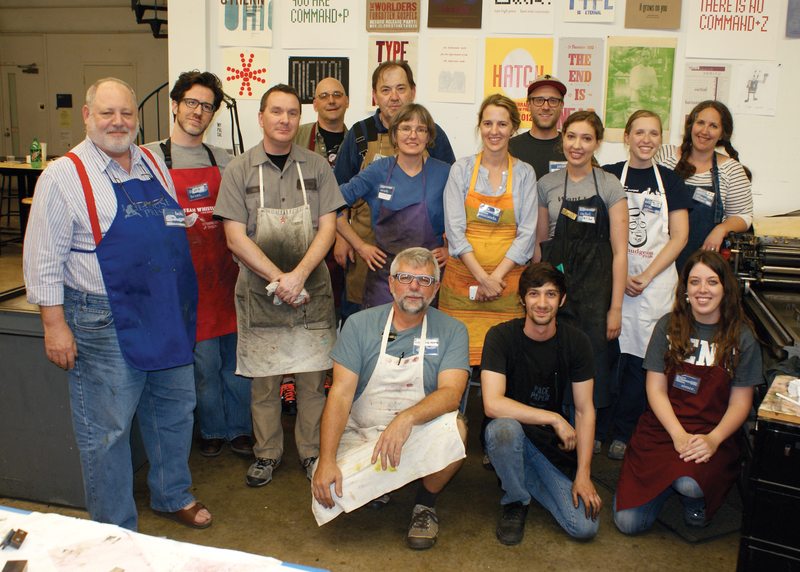 And it was even more fun to spend time with fellow Ohio-based letterpress educators and enthusiasts. Much thanks and appreciation to Bob Kelemen for planning and hosting the Ohio Vandercook Maintenance workshop!